With energy bills skyrocketing, it can be tough to battle against the Las Vegas heat in a cost-efficient way. There are many common mistakes homeowners make when they try to cool their house down that end up costing them a great deal in bills and repairs. 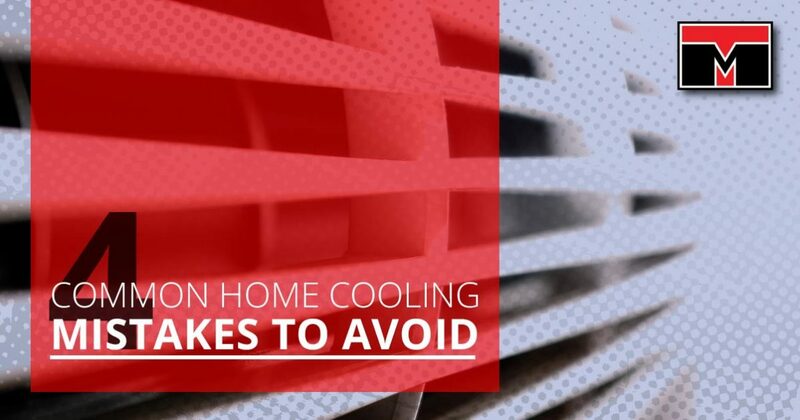 With that in mind, we’ve gathered some of the most common mistakes we’ve seen, along with some helpful advice for how you can stay cool no matter how hot it gets here. If your HVAC system isn’t operating properly or you just want to get a tune-up, call us at Tippetts Mechanical. We understand that an air conditioner isn’t the most aesthetically pleasing appliance in your home. However, when an air conditioning system is blocked off, it will be unable to work as intended. HVAC systems require air flow to work properly, so whether it’s an outdoor unit blocked by shrubbery or an indoor unit hidden behind furniture, your system will be working harder to do its job. That increases energy bills while reducing the lifespan of your system, ensuring you’ll have to replace it far sooner than you would otherwise. Keeping your HVAC system clear of debris like leaves and dirt will also help it operate properly. It’s recommended you maintain at least a five-foot clearance between the top of an outdoor unit and the lowest point of whichever object may be directly above it. If trees and branches are above that five-foot minimum, falling leaves and branches can still cause issues. For indoor units, keep them clear of curtains and furniture to ensure proper air flow. If you’re like many homeowners, you likely didn’t pay too much attention to where you placed your thermostat. A thermostat reads the temperature of the room and tells the HVAC unit what it needs to do to achieve the desired temperature. The problem arises if the thermostat is placed in an inordinately hot or cold area of the house, as it will throw off its readings and cause erratic behavior. If it is placed near the laundry room, appliances, or a sun-facing window, it will read the room as much hotter than the rest of the house actually is. Even a floor lamp will generate heat that can throw a thermostat off. It’s also a good idea to avoid exterior walls, as it will read too much of the outdoor temperature and results will be skewed. Instead, place your thermostat in a regularly used room or hallway, as that will best represent the desired temperature of the whole house. Modern HVAC systems are designed to run much quieter than systems of the past. It’s for that reason that out of place noises should be checked into as soon as possible. Loud noises coming from an HVAC system is almost always a sign that something is wrong and needs to be fixed. When this happens, it’s best to contact a qualified HVAC professional to diagnose the problem properly. With how delicate and intricate central air conditioning systems are, you’re more likely to cause permanent damage if you try to handle this on your own; leave it to the professionals! Strange noises need to be checked out as soon as possible, as do strange smells. If you smell an abnormal or stale odor emanating from your system, it’s vital you contact a professional to handle it. It could be caused by your HVAC system failing, but it can also stem from issues within your ductwork. A professional will be able to diagnose the issue much quicker than if you spent all weekend tearing apart the system looking for the trouble. Many people have said they thought air filters didn’t need to be replaced all that frequently, but that just isn’t the case. Their purpose is to pull dirt and dust out of the air so you can breathe clearly. When that dirt and dust begins to clog the filter, your HVAC unit will have to work much harder to push the air through, which reduces your system’s lifespan and increases energy bills. Depending on what type of filter you’re using and what the manufacturer recommends, you will need to clean or replace the air filter every 30 days to three months. When airflow is unobstructed, your HVAC unit is able to work as it was intended to, which means you’ll have a comfortable home with good air quality to enjoy. We’ll be taking a look at a few more common home cooling mistakes that you should avoid in the near future, but we hope this gets you started on the path to a more energy efficient and comfortable home experience. If you have noticed strange smells, noises, or other trouble coming from your HVAC system, call the HVAC gurus of Tippetts Mechanical today!